This module focuses on the pivotal role of vocabulary in language acquisition, communication, and instruction. It first reviews the nature of vocabulary knowledge, the mental lexicon, and different contexts of vocabulary learning. It then explains how we acquire vocabulary and refine vocabulary knowledge over time. The primary emphasis is on how language instructors can promote evidence-based vocabulary instruction in the classroom. To this effect, the module highlights telling research on the effects of specific tasks (e.g. sentence writing and copying target words) and different ways of presenting target words (e.g. having multiple talkers instead of a single talker producing the target words). 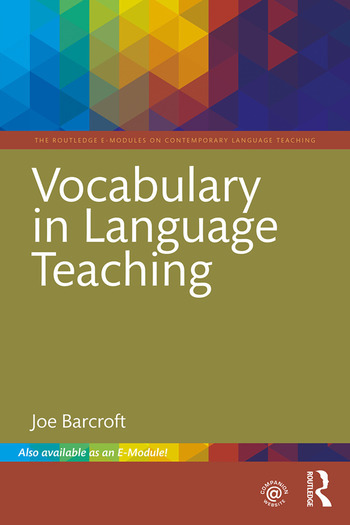 It also outlines an effective approach to teaching vocabulary, one that emphasizes multiple presentations of target vocabulary, specificity in the relationship between task type and learning outcomes, and the gradual build-up of language-specific vocabulary knowledge over time. A sample lesson based on this approach is also provided. Joe Barcroft is Professor of Spanish and Second Language Acquisition in the Department of Romance Languages and Literatures at Washington University in St. Louis, USA.